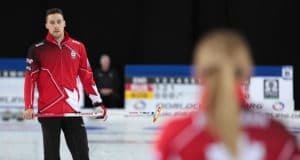 Day Two of exciting play at the 2014 Canadian Mixed Doubles Curling Trials is close to completion, with all 32 teams having finished two games, and some three, of their seven games in round-robin play within their pool. 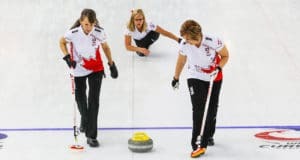 A couple of early surprises saw the young New Brunswick team of Ryan Freeze and Leah Thompson take down defending Champion Robert Desjardins and his new team-mate and Quebec Scotties second, Brittany O’Rourke. In his first outing in Mixed Doubles, Adam Casey and Marie Christiansen were down 6-1 after four ends but came back to win 7-6. Scott Howard and Tess Bobbie started with a four-ender, then gave up a four-ender and then scored three to lead 7-4 after three ends. Scott and Tess did go on to win that one to go 2-0. It is a fun game and everyone is loving it! Kaitlyn Lawes and her nephew Connor (a definite future star) won all three of their first games as did John Morris and teammate Heather Smith (skip of Team Nova Scotia at the 2014 Scotties Tournament of Hearts in Montreal). Jenna Loder and Joshua Heidt are also at the top of their pool with a couple of early wins (although they dropped their third). This field is loaded with National team players and the shot-making is amazing to watch. 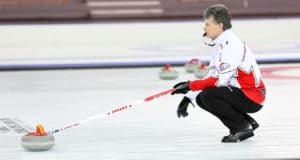 Two game winners include: Adam Casey and Marie Chritiansen (NL), Kaitlyn and Connor Lawes (MB & ON), Charley Thomas and KaLyn Park (AB), Jenna Loder and Joshua Heidt (SK), Scott Howard and Tess Bobbie (ON), Mike Armstrong and Ashley Quick (SK), Patrick Janssen and Clancy Grandy (ON), Jason and Colleen Ackerman(SK), as well as Heather Smith (NS) and John Morris (AB). Morris and Smith got a scare from Team Ontario when they gave up a four in the early ends but came back to win handily. 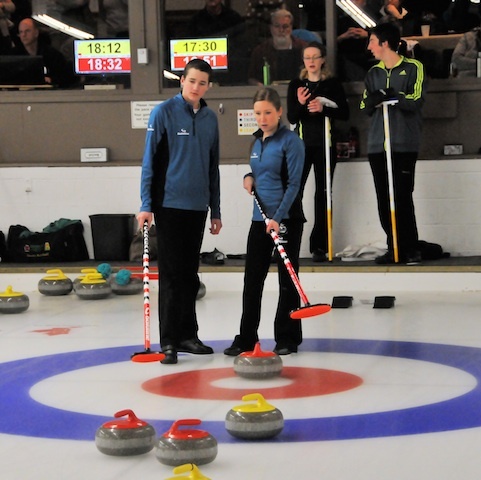 In the first six-ender ever recorded (we believe) in Canadian Trials play, Charlie Thomas and KaLyn Park from Alberta, turned the trick in the second end of their game with New Brunswick. They went on to win 12-3 in six ends. 1-4 and will receive a bye to the second round. The runner-up team in each pool will be seeded 5-8 and the final four will come from the best remaining records from all the pools combined. The Draw Shot Challenge becomes extremely important at this point as it will decide the ties for the last four spots. The quarter-finals are scheduled Sunday morning, the semifinals in the early afternoon, and the final will be played at 5 p.m. on Sunday.